By the mid-1970s, Albania was a pretty bleak place; the poorest country in Europe, cut off from the rest of the world and governed by a strict form of ultra-Communism. Enver Hoxha, the increasingly paranoid dictator who ruled Tirana for 40 years until his death in 1985, created a deeply repressive regime which attempted to control all aspects of everyday life as well as fostering an all-encompassing cult of personality around himself. Hoxha’s only foreign friend was Maoist China, who alongside Albania, viewed themselves as the only REAL communists left – the Soviets had gone all wishy-washy and soft towards the West as far as they were concerned. China and Albania, until Mao’s death, were united in a weird isolationist alliance in which two maniacal despots kept their people cut off from the rest of the world, bombarded them with ridiculous propaganda and consigned them to dire poverty for decades. 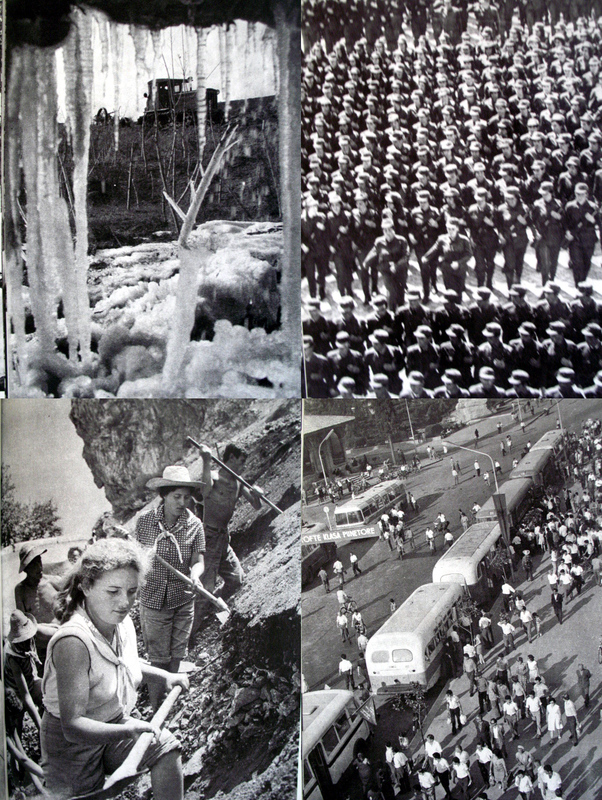 According to this fascinating English language history of Albanian photography by Qerim Vrioni (pages 5-24), the regime, in common with most other Communist regimes who fully appreciated the power of the image in the moulding of minds and attitudes, developed photography as a propaganda tool soon after assuming power in 1945. 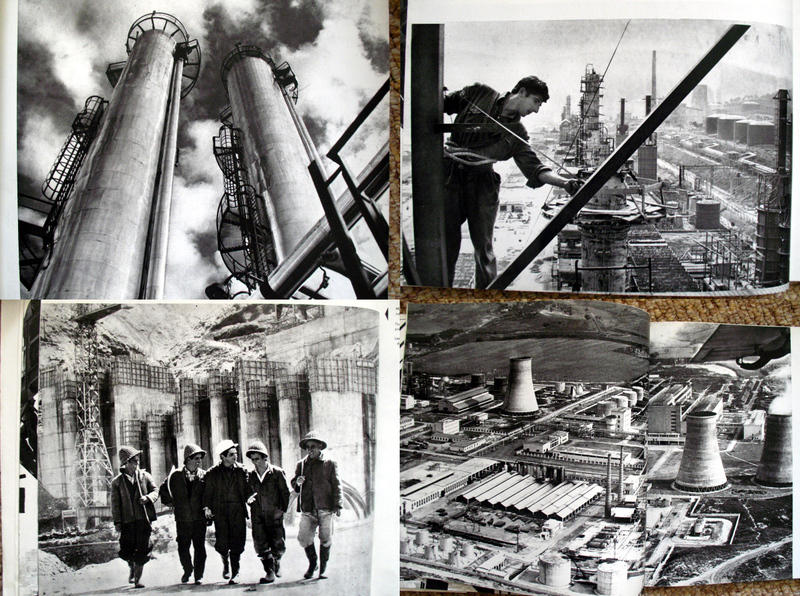 This would appear to have followed the model adopted during the early stages of Stalin’s assumption of power, with photographers being encouraged to produce unambiguous work that concentrated on specified ideological themes that showed the better future under construction. Individual creativity appears not to have been encouraged. 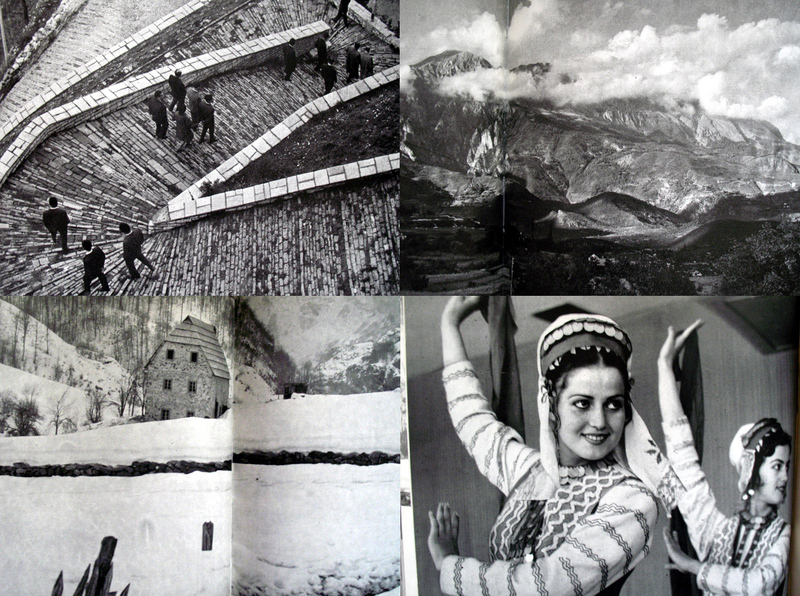 The isolation of Albania from the rest of Eastern Europe after Stalin’s death also affected the development of photography and it would appear that from the 1960s onwards, Albanian photographers turned inward and didn’t participate in international competitions. 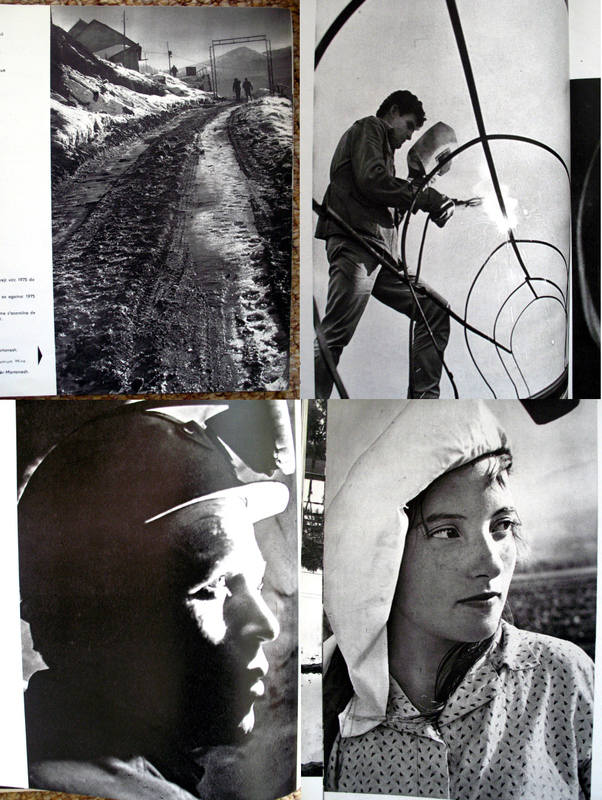 However, as if to compensate for this self-imposed quarantine, rather than being subsumed into the collective propaganda effort, photographers now began to be credited for their individual work, which, according to Vrioni, served to invigorate photographic practice. 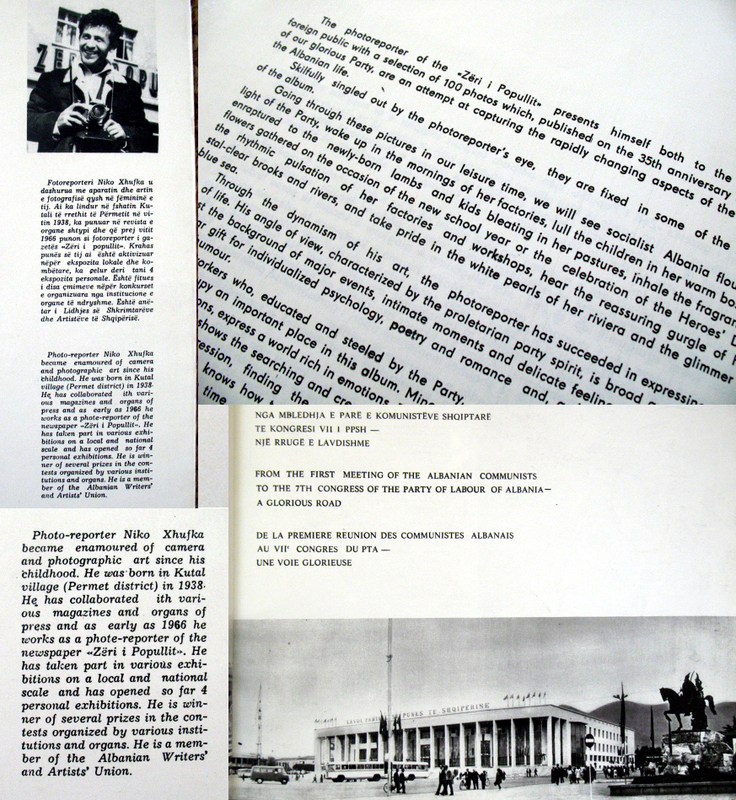 However, the first national Albanian photographic exhibition only took place in 1974, indicating a degree of stagnation which is far beyond what occurred in the Soviet Union or East Germany during this period. 1976, the same year this book was published, saw the death of Mao, which deprived Hoxha of his sole supporter and ally. Just like Khrushchev when Stalin died, the Chinese soon began to dismantle Mao’s strict ideology and implement reforms, whilst paying lip-service to the dear departed leader. Fearful of the same happening to him, Hoxha pumped up the rhetoric and tightened the leash within Albania. Bellicose assertions of self-reliance accompanied by purges did little to paper over the cracks that were now appearing in a stagnant economy deprived of even limited foreign support. Increased repression and paranoia now reigned supreme. 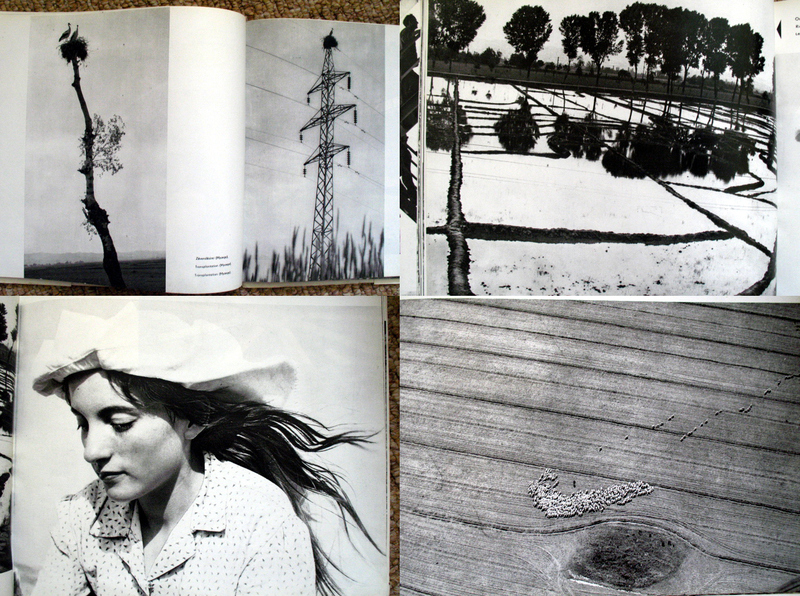 Turning now to this softcover book which was published in 1976, which is presented as a series of artistic images produced by the photographer Niko Xhufka. (By the way, as I’m using it a lot, the Albanian XH is pronounced like a J in English). Information about Xhufka is hard to come by (if anybody knows anything more please let me know) but he appears to have been a photojournalist primarily working for the official Party newspaper Zeri-i-Popullit. As well as being a member of the official Writers and Artist’s Union, the brief biography on the dust jacket also states that he has won certain unspecified prizes and had at least 4 local and national exhibitions (any information out there about this greatly appreciated). From this information and the fact that this book was published by the official 8 Nentori state publishing house, it’s fair to assume that Xhufka was an establishment figure and not part of some avant-garde fringe group pushing the boundaries. Even though these are presented as artistic images they clearly serve a political agenda and this is reinforced by the one page introduction which is a bombastic assertion of devotion to the glorious leader and the wonderful society he has created. 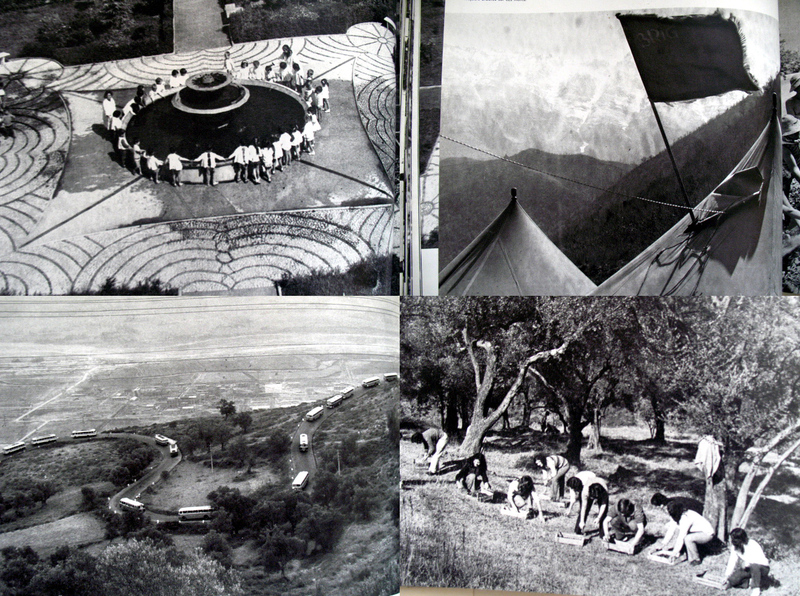 The text and captions are in Albanian, English and French, indicating that it was designed for the (albeit limited) audience of bemused foreign tourists and the deluded members of Maoist/Stalinist fan-clubs who could be found in many a Western European and American university campus during the 60s and 70s. This monograph is more of a ‘greatest hits’ collection rather then the rhythm it claims to be. It consists of singular images roughly divided up into various themes and there is no serious attempt to build a narrative structure other than presenting the crude message that Albania under Hoxha is a land of bliss. We have the usual broad categorisation of images into heavy industry, bountiful agriculture, stern looking soldiers, smiling children, peasants in traditional costume and the natural beauty of the countryside. 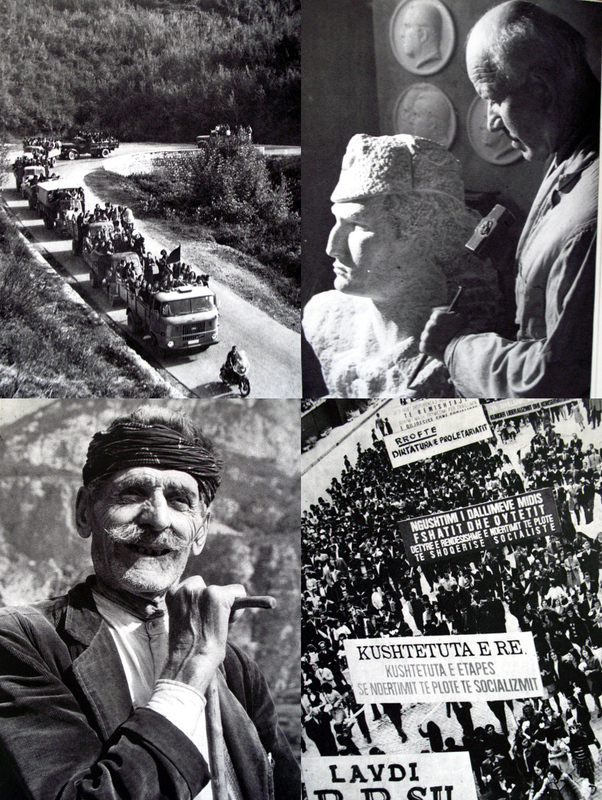 The ideological message is reinforced through the captions which present Xhufka’s images as proof of the bountiful present and the happy future Albania has under the wise and benevolent guidance of the Party and the leader. The smiling leader only appears once in the book, accompanied by a happy schoolkid, which in the context of 1970s Albania is interesting in itself; art photography for a foreign audience apparently gave you licence to downplay the cult of personality somewhat. Officially sponsored books and magazines glorifying such regimes usually like to play it safe; their audience is a wide one and they don’t want to make people think about things. In fact political propaganda is designed specifically not to make people think. The ideal is to have an audience of sponges who will believe everything that is said or shown to them. Censors like to understand what it is they are passing and artistic images, which might or might not be critical of the regime somehow, could land you in a lot of trouble if they later turned out to contain some sort of subversive subtext that you didn’t understand. That is why repressive regimes have such a limited visual repertoire; the censor’s survival creed is to keep it simple. However in Xhufka’s case, I would imagine they didn’t have to worry; there is nothing here that was going to cause any sleepless nights. 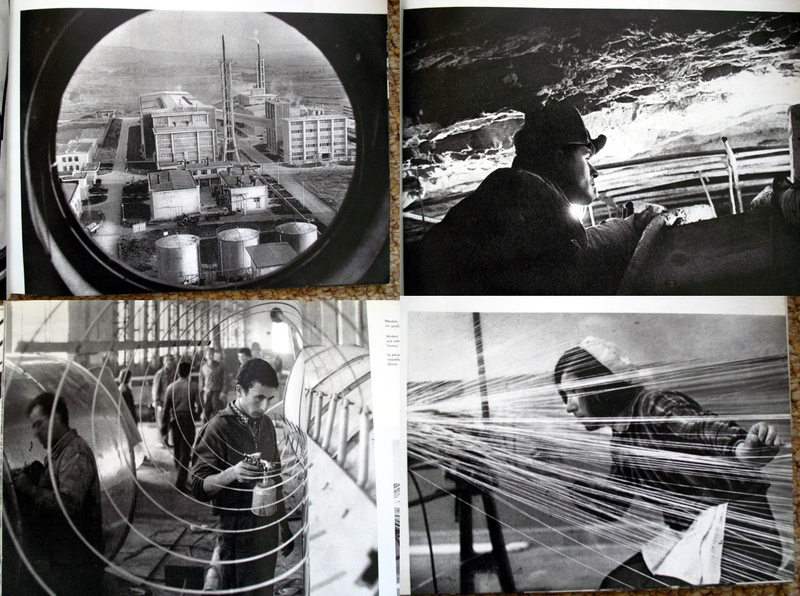 A great deal of the book is made up of photographs that are straightforward depictions of officially sanctioned themes of the like we see again and again in official propaganda publications. Portraits of predominantly male industrial workers and female farm workers present us with the traditional heroic concept of collective labour in the service of the greater good that is a integral part of of communist propaganda the world over. In a similar vein, the other main group depicted are schoolkids accompanied by hackneyed ‘children-are-our-future’ captions which serve to conceal the rather grim reality of a future under ‘uncle Enver’. However, images of military hardware and determined looking men with machine guns soon disrupt the cloying idea that what we are looking at it some sort of Disneyesque theme park; scary violence rules the roost. Such photographs are the formulaic stuff of commie photobooks and we have seen them all many times before. However, because Xhufka is presented as an artist rather than a mere propagandist, he is allowed a little more leeway in this work. The abstract aerial images of terraced fields and farmland are a point in case, as is the image captioned ‘The Dance of Cobbles’ of the steps in Gjirokastër (see photograph below). Although not particularly exciting from today’s perspective, for a repressive regime like Hoxha’s Albania that viewed all photography with suspicion, I would imagine that this would have been cutting edge stuff. 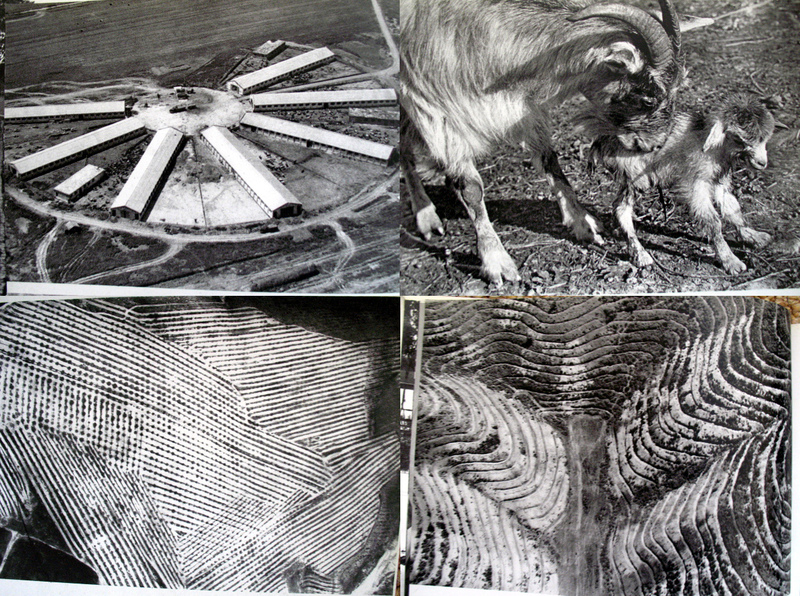 These images are reminiscent in some ways to Rodchenko’s work of the 1920-30s, when he experimented with different viewpoints to try to produce a new visual language in keeping with the promises of a new society being created. For Rodchenko and his followers this period was a very brief interlude before Stalin and his cronies stopped all experimentation and brutally enforced straightforward Socialist-Realist depictions of approved subjects. It is interesting that what we are seeing here is the same process in reverse; over time, despite its increasing paranoia, the regime permits a limited degree of creativity from safe individuals who are part of the system. In return for absolute loyalty, their creativity is then both tolerated and even glorified to a certain extent while being used to press home the message that all is well under socialism. By contrast, amateur photography is increasingly regarded as a suspicious activity undertaken by subversives and foreign spies lurking unseen within the population. All photographs not subject to state control were seen as a source of potential threat to the regime. 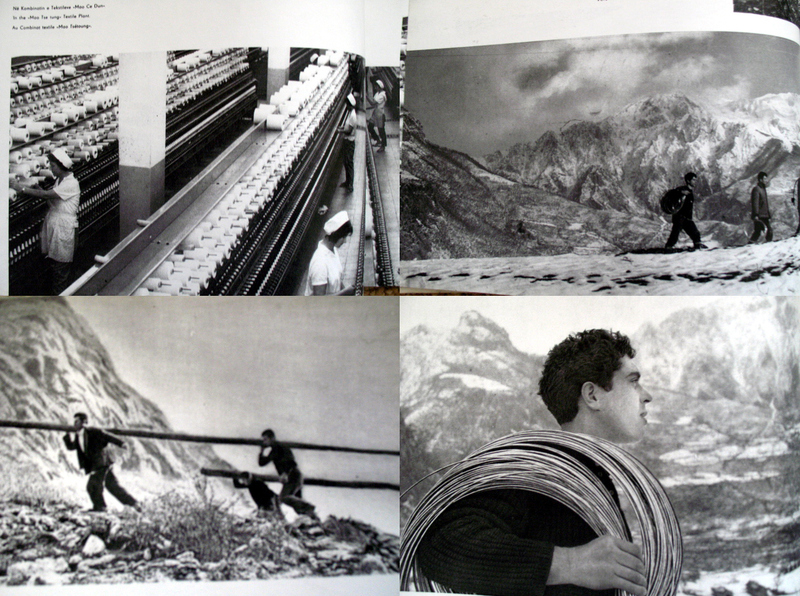 Images which might contradict the official narrative of the Albanian state, as increasing paranoia set in, became more and more dangerous and measures were taken to control and restrict photography. Xhufka, whose loyalty could be depended upon, was permitted to produce images whose aesthetic qualities would, if taken by another person, be regarded with a great deal of suspicion by the authorities. To my mind, by allowing Xhufka to take credit for his work this signals an ever so slight change in how the regime wanted to be seen by the outside world. No longer an anonymous member of the collective, Xhufka’s images are presented as an exemplar of Albanian art and creativity. These images then are what the official regime regarded and defined as worthy of the status of art. By permitting and encouraging his individuality, the regime is elevating and privileging him as a shining example of what could be attained under their guidance and his images reflect this. For a select few, individuality was permissible as long as they knew their place; for everybody else it was much safer to keep a low profile. Thanks for the comment – all I can suggest is keep looking on ebay or ABE books and see if a copy of the book turns up. Thanks. Your blog is very nice. 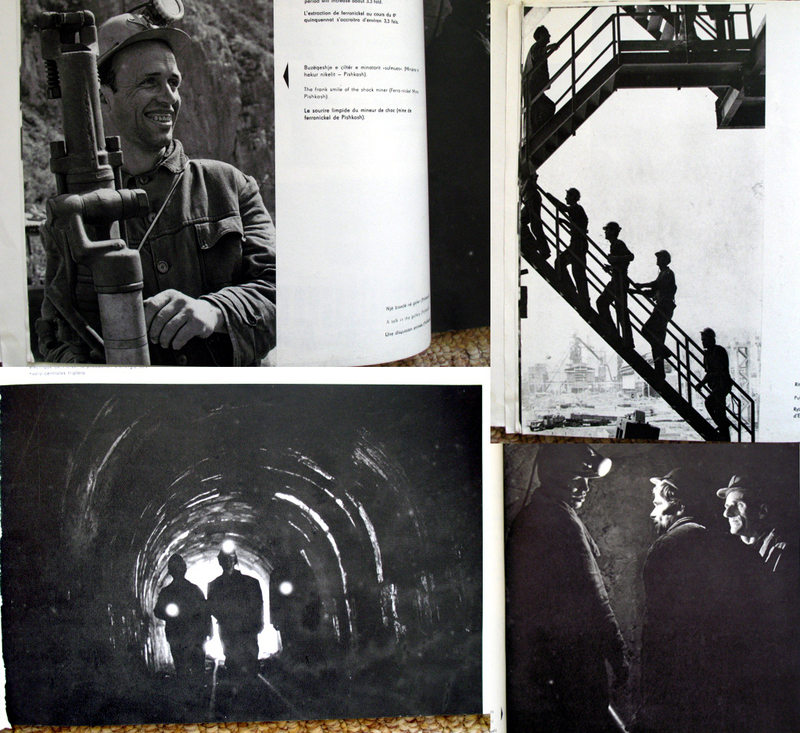 I’m a really lover of propaganda photobooks and I have an interesting collection. 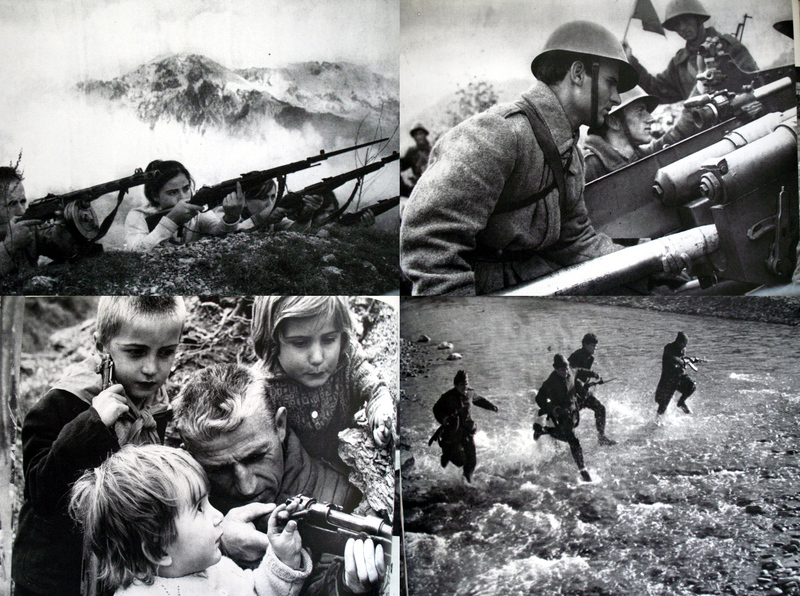 Please let me know if you need some photos or informations (Fascism, Third Reich, Soviet propaganda, DDR …). Thanks for that and I’m glad you’re finding my blog interesting! Always good to hear! It is not true that I have made an official picture photo montage of Enver Hoxha. “This is a statement that seeks to do next” Forum Journal “files known newspaper” Voice of the People “Niko plumes, which seeks to clarify the position of him, after publication in the “Forum Journal” the memoirs of a journalist to “PO”, the Albert Shala, where at one point says that was the photographer of the newspaper along with Sulo Gradecit who made photo montage of the official portrait of Enver Hoxha. “It The fact that I made pictures of Enver Hoxha, but all do i send pictures in the press of the party Central Committee, then there were specialists who do retushimet “, – he says the” Journal “. According wattles, retushime of Photo made today, but then he, as a photographer, had nothing to do with them, then, according to him, “who dared to do montage, that if he might know a thing at the moment exterminate us.” journalist Albert Shala shows in his book “ZP” 18, 17 or 16 chief editors, “that picture of Enver Hoxha, distributed to each office in each cooperative was made a montage of two photographs, the head was photographed by Niko plumes, while the body by Sulo Gradecit chief guard. If the plumes, categorically denies this fact, even the inclusion of Sulo Gradecit in such a technical enterprise. “Neither I nor Sulo Gradecit have not done so, since the press sector, as I said above, there were specialists and painters on the job,” said the official files of the “OP”, who has worked in this newspaper for more than 30 years. Such an action, namely to have retushimet montage or special section in the Central Committee of the Labour Party. “My pictures were taken by this sector, where the where retushoheshin brought in China or in Africa I do not know anything, it was not allowed to know nothing of these” – further highlights plumes files that already has left the profession its here in Bangladesh. According to him, Albert Shala, a journalist who has written the book, published by “The Albanian newspaper” has already met twice, and that these two had met before the arrival of democracy even in the street and do not have such conversations. Plumes notes that before he scored in his memoirs, these kinds of conversations, should be asked in advance for their authenticity. He says that such a fact, learned only when he read the memoirs part of Shala, published in two parts in the “Forum Journal”. While Rejects official photo photo montage of Enver Hoxha, Niko tassel, shows that another passage where he mentioned the book colleague Shala, is true. It is about one simple fact, while performing work of wattles, where as personal guards of Enver Hoxha, threatening, because it was very close to the leader, Enver itself is telling them to “let the boy do his job.” “But this fact is true, even this did not I know it immediately, so at the moment, I heard much later time,” – said Niko files known plumes. 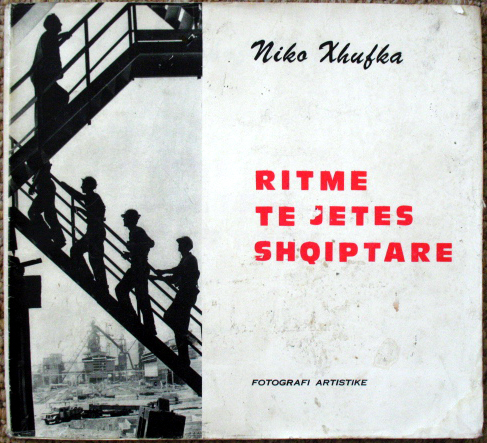 In his book, Albert Shala, publisher of “PO” and for a period of time the Albanian Radio Television editor, “ZP” 18, 17 or 16 chief editors “has made memories for one of the most important structures of the Party work, for people who have worked there, for the scenes, backstage and small details of a newspaper, that the leadership was of great importance and which caused great painstaking. From his book, we learn that four of its chief editors , have ended in jail, or are away from the job cuts, just because of “political mistakes” that were found by the party. Second article through Google translate! The Albanian newspaper “published today in the reflections of a journalist to” Voice of the People “and the Radio Television, Albert Shala. He was part of these two important structures of the Communist Party and later the Labour Party and in his book “ZP 18, 17 or 16 chief editors …” gives the atmosphere of work in exactly two most important tools of the party-state , and especially Enver Hoxha, to embellished a reality terribly poor and vulnerable. Shala, whose book was published in 2008 by publishing house “alb-Paper”, gives details of some of those behind the scenes of what society does not recognize the Albanian violated or failed to catch the dot, because of the distance that these two institutions were created with the reader. Interesting to read the details and behind the scenes to reveal the true character of people and events that occurred during the communist dictatorship so sensational. In this book we can learn the secret of the official portrait of Enver Hoxha, who is a montage, as Niko has photographed head plumes and body Gradecit Sulo has photographed and photo montage is done with permission from the Gradecit Enver as wattles were not allowed never telling the truth about that picture. Further there are other details, such as investigators go to “PO” to seek the enemy in its midst, after Enver picture in 2500 was shared between copies. While the names of the characters of today, but the important figures of the time when headed “ZP” We understand that Pacrami Fadil, one of the editors of “OP”, despite being condemned by the regime, has been a hard man dependents and Shala remembers how tough it was brought Bilal Xhaferri, reminding the latter shooting the family. Or Bocaj Sadik, director of the newspaper again, had not left the event without being raised to attack Todi Festival Lubonja to 11. Or that the latter, then Lubonja, who has been editor, had received criticism for initially easy Festival 11 and only when told revisionist realized that he was prepared to end. But this is a piece that we publish today from the details of the behind the scenes, of course, to understand why it was so long and why Enver Hoxha could not do the only dictatorship. For half a century, E.Hoxha is called the founder of “Voice …”, and creator of the Albanian press, called “new”. But presume to bring some data to indicate how close or far he has resisted the newspaper. -No reporter asked the “Voice …” does not remember that for the period 1948-1985, when publication began as an organ of the Communist Party after the Labour Party and until his death, E.Hoxha, known as creator, inspirer and founder of this newspaper, to have violated its editorial board. Someone – as Todd told me after returning from prison and exile Tirana – and then asked: Why have you found this painting too dark to put the main corridor of the “Voice of the people”? Todd responded with a phrase like this: because it reminds me of the time freed the first numbers of this newspaper, in late summer of 1942 … E.Hoxhës décor presence in the newsroom was filled in by his portraits in almost every While in office … the second-floor corridor was a bust of him, from the many who had known the work pattern of Odhise Pascal, our acclaimed sculptor … Photography tassels known Niko said: “Nobody but me and Sulo Gradecit, chief E.Hoxhës guard, which for long did the role of the personal photographer of the party leaders did not know that the official portrait of Enver Hoxha was composed of two parts – the head was mine and Sulos body. He, Sulu, he had managed to edit up to a level not understood anything from anyone, until he reached the portrait of the official was found in the offices of cooperatives in remote mountainous areas. Obviously, I had to stop to say that I have prepared an official portrait, although I had photographed a hundred times. “But – following Niko – he had a montage of good post. I recall that there was a concert at the Palace of Sports in the capital with the best artists who participated in the Folk Festival Gjirokastra and everyone expected E.Hoxhës entry hall … I experienced a strong push in the groin over my head and saw that someone shtërngonte teeth, how to tell me “I know what to do.” At the moment I heard the voice of Enver Hoxha to say: “Leave the boy to work.” The guard disappeared a blink of eyes … He was very reluctant to take stills before me, pretending to be carefree, to change the complexion instantly, become the lamb, the smiling, especially the smile. “… On the morning of May 2, 1984 in publishing house “Union”, below, on the first floor of the newspaper had come some strangers who quickly became identified as an investigator, directly bring custom interior minister. What had happened? At night, when the newspaper “Voice …” is printed in rotation in greater number than the one ordinary day, as would be reflected in the May 1 holiday, for quite awhile, several minutes, the lack of attention, knives The ROTATIVES that paloste paper in four, had fallen on hard by prertë between the jacket picture of Enver Hoxha’s great the stand popular. Were damaged, it mbajh remember, about 2500 copies. In drawing the portrait emerges F.Paçramit another side of his nature as managers: the severity. No wonder. Arrogance has been the way of behavior of many senior cadres of the Party of Labor and the state. But this seeming always in the name of the party line, of ideals, though often hidden disability management tool and was forced to subordinates … This spirit, which the party had cultivated in her the forums high, felt in different forms in daily logs, its central body. Pacrami Fadil was no exception from strict management type, as in sheath, stuck, as long as this mode of behavior indicate that you have good jobs … Another case where he found it was too harsh in the discussion of I.Kadaresë famous novel “Wedding” in a room, is on the premises of the National Theatre, an event where I was present somewhere at the end of rows filled with participants. Much has been written about that experience, even to speculation, especially how he reacted to Bilal Fadil Xhaferri, reminding the audience that he, we, then the party of power, we shot the father, or that I, Fadil, I were among those who have helped Bilal, which may be true, but highlighted by him in that moment as to say that “I am god” of works of art and culture in the capital. Later, after the 90-to he confirmed in the form of half-truth of that event, but the harsh words said do not remember … Like many others, Bilal, pity me then, for the position held against him – I remember leaving the room, as was done in the face flame, – and I thought like many that day very difficult to come to … Portraits of F.Paçramit in relation to people, meet me in memories of a meeting-marathon in Radiotelevision in 1972. Party organization of Television, where he became a full analysis of three days and three nights, many things were discussed considering a letter it had sent Hysni Kapos, former Party secretary of the Central Committee, former Director of Television, Klimi Misa, full of complaints addressed to the new director general of Radio Television of the time, Lubonja Todi. Fadil, at that meeting, had come as delegates. Analysis is left to mind for this fact: Fadil and Todi, the members of the Party Central Committee internship and laws The same, knew it support each other even when they can not be right. But do not exclude the possibility that Fadil was sent as a delegate to the analysis in order to support mutual pulse taxed him with Todd, then so much talk that, although laws The not go too well. Almost no scar not preserved in 80-90 years-of by the existence of Sadik Bocajt editor of “Voice …”, even by former journalists of the old newspaper, among those who had once worked with. Consequently, during the years in the newsroom is very little data or impressions have on its performance. … Some 11 months after the song festival in Radiotelevision, remember that Sadik Bocaj, flanked by Jafar Spahiu, then candidate Politburo, has been delegated to the Central Committee at a general meeting of communists in this center of large propaganda, where the tests were completed that hit Lubonja Todi, director general of the institution. The collection has continued three days. S.Bocaj intervened less, but generally severe, demonstrating that he had come to prove in the eyes of the participants in that meeting that Todi had slipped from the path of the Party. In order to achieve this goal, had to make a somewhat difficult role, as a representative of management in the process of analyzing the differentiation made between Communists who had fallen into error … On how impressed during holidays extended the marathon meeting, the smoky fuajenë where coffee consumed without judgment, he and other participants, delegated or old communists working in Radiotelevision, Todd avoided if the latter had zgjeben … Lubonja Todd, editor of “Voice …” the second half of the 60-years I knew when it came out in Tirana, Korca, acting director general of the Albanian Radio Television, in 1972 … Somehow enigmatim fact remains that Todi not suffered as propaganda secretary of the CC district of Korca, by putting on stage the drama “brown spots” of Minush Jeros the theater troupe “Cajupi” which was honored even with the flag of the National Theatre Festival and only two days later was considered a criminal antisocialist. There was the end of the year 1969. Todd apparently saved it for applause because it gave veter M.Shehu, rule number two, although not declared … His return to Tirana from Korca in the important post of general director of Emigrants in turn had been somewhat deserved, as corrected Party something was wrong in this context, relations with its old already … For Festival in RTV was held meetings without end which was preceded, as usual in collision cases, various rumors as “Comrade Enver said the friend Ramiz said so too.” The festival was not liked above. Even me, as my friend and no, he had no particular impression. Today the festival was presented as rjeshtim largest of several anti antiparti of names, mostly artists, who actually asked at that time neither man how to do this and how to do it. But by appealing to dress somewhat anti the event, though remember that so well justified E.Hoxhës attitude towards him, talk to the standards of practice time to implement the party-state. Between us, the employees at RTV, the problem then was admitted as a sotto voce way: “E, CE then! A festival is a festival. Some songs were sung differently by tradition, some may have imitations, some were teprua in wardrobe, but can legitimize these “reprisals” in people who followed this artistic event? “… “Enemy” nobody told him not to start the analysis, but it was labeled as “revisionist” in an editorial meeting of heads of radio and television, then we realized it’s not the end that was preparing a severe for but not yet, that a cycle of analysis, deprivation, transfer of turnover, many others waiting. 120 files of Emigrants employees, most of the full talents of specialists among them, left several months later in various districts of the country, because it had to be circulated, transferred, practically expelled though this word is not pronounced, as jutfikim that he had been a festival prepared antiparti act, as presented in the famed 4-th Plenum of the Central Committee of the PP. Lubonja Todi should assume responsibility for everything in the festival, even the costumes, even to make up for telephone connections to the districts during the nights of the festival, for spërdredhjet of a singer, or even bringing on stage the Çurçisë Gasper, who led the formation The small orchestra, a musician who had blood modernity, but that unfortunately did not understand wanting to walk a step ahead of others in the wrong, can plunge into bathos, as he fell. The festival was … Director Nicholas Zoraqi, director Mihallaq Luarasi, not to mention other names were taken with it. That early analysis Nicholas was moved or was vetëlargua, did not participate in any meeting, being employees at Radio Tirana, it can be understood, to avoid any possible punishment, and perhaps without intending or custom, leaving Todd to account for the qualities of musical parts, field and did not know why I had not recognized. But Mihallaqi “had come from outside”, but “the festival of rrasi (introduced) within”, as some friends would say at that time, because he years in prison considering that case. For him, there was then a mountain of charges. I do not take do list of those who suffered, nor the analysis of the event, but remember that one of my popular, Justina Alia, beautiful voice which had been delighted when people who had started the National Song Festivals Child in Shkodra in the early 60’s, for many years, nearly 15, was banned from singing on stage, to the recall, for a sentence to say just in passing, if përgatisje liked to sing a recital where the song English (!). But when you think that 15 years is about active artistic life of a singer, she had shterpëzim attitude, not anything else. Hello! Thanks for this post and the interview with Niko Xhufka. Like the previous commenter, I am searching for a copy of this book but it’s not showing up on WorldCat, Ebay or ABE Books. Any tips that you have would be great. Did you ever come across any material related to the bunker construction in Albania? I’m looking for propaganda photos and materials related to their construction so if you have any leads, I’d greatly appreciate it. I have worked for thirty years as photoreporter for “Zeri i Populit”, Albania’s biggest daily newspaper. Alongside my daily job, I also had a special assignment: to photograph Enver Hoxha’s daily activities. I’m recipient of Albania’s “Naim Frashëri” medal for arts. I have opened many exhibitions and most notable one-man-exhibitions have been in Tirana, Rome, Paris, Brussels, Berlin, on which the press has written many favorable reviews. I have won several national and international prizes for my photography and so far I have published three albums: two on Albania and one on the Arbëresh, Albania’s emigrants in Italy from 1990s. Berat through the ages. 240 pages, colour. Albanian castles. 100 pages, colour. Albanian Riviera. 180 pages, colour. Skanderbeg. 240 pages, black and white and colour. Albania, the socialist years, 1965-1991. 300 pages, black and white. Enver Hoxha, a life. 300 pages, black and white. Dropull, the region. 100 pages, colour. The old churches of Albania. 100 pages, colour, black and white. I discovered a copy of this photobook in my personal library and would consider selling it in case anyone is interested, seems as if it’s rare to find it now.